The Hardanger bunad is probably the national costume that has the longest association with the Norwegian royal family. Princess Maud of Wales received a costume as a present from the city of Bergen in 1893, when she visited the area. The photograph was later turned into postcards. Queen Maud’s Hardangerbunad joined the exhibition of her clothing (Style and Splendour: Queen Maud of Norway’s Wardrobe 1896 – 1938) at the V&A Museum in 2005-2006. Crown Princess Mette-Marit received a Hardanger bunad as a wedding present from the Hardanger council in 2001. She wore the bunad on the county visit to Hordaland in 2002. Her maternal grandmother came from the farm Fosso by Kvam in Hardanger. Mette-Marit last visited the farm when she was 6 years old, and remembered playing with the goats there. Mette-Marit has frequently worn the Hardanger bunad since she first got it, lastly for the 2014 Christmas photo shoot at the palace (and the photoshoot the year before that.) 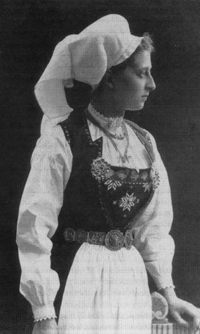 On the service marking the centenary of the coronation of Haakon and Maud in 1906, Mette-Marit also wore the Hardanger bunad. She also wore it when greeting the Children’s parade on May 17 2003 at Skaugum, in 2006, in 2010, and on May 17th, 2014 on the palace balcony for marking the bicentenary of the constitution.